High Voltage Stopping Power With a quick switch, the Monster Stun Gun fires of a disarming and temporarily immobilizing 25 million volts, with a spark so loud that just the sound can intimidate and deter potential assailants! For increased security and peace of mind, a removable disable pin deactivates the stun gun to prevent it being used on the owner in an emergency situation – protection begins when the pin is plugged in and the stun gun is switched on. 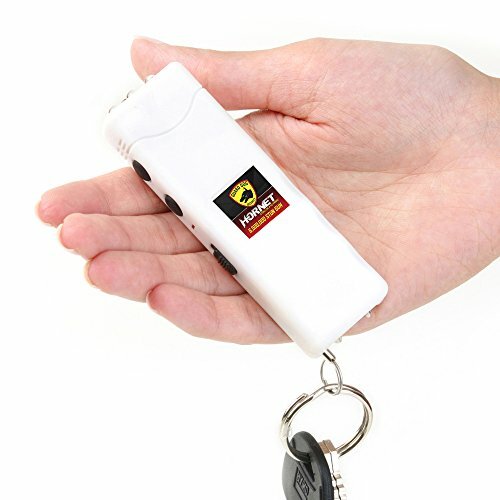 Identify and Illuminate Surroundings The Monster stun gun features a handy and powerful built-in LED flashlight, to throw some light on dark corners, alleys and parking garages. The powerful single LED light is instantly turned on for quick identification or increased visibility. Convenient and Secure Compact and lightweight, the stun gun is supplied with a handy nylon holster, so you can always keep your stun gun with you as part of your daily carry. The built in rechargeable battery saves money and ensures your stun gun will always be powered up and ready to use – you don’t even need a charging cord as the stun gun plugs directly into a wall socket. 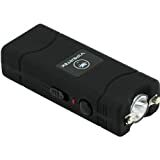 Guard Dog Monster Stun Gun Flashlight Features: 25 million volts with loud zapping sound Built-in flashlight Disable pin Rechargeable battery Built-in charger Nylon holster Safety is no accident. Buy your Stun Gun Flashlight today!